Solar energy falling on Earth in one hour consists of more power than the world uses in one year. The amount of solar energy is so vast that in one year it is about twice as much as will ever be obtained from all of the Earth's non-renewable resources of coal, oil, natural gas, and mined uranium combined. 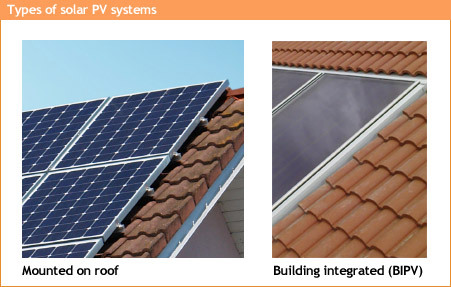 CompareMySolar focuses on the photovoltaic (PV) solar systems for residential applications. We make the orientation phase about such a system for your own roof both easy and accessible. Rooftop solar installations consist of a set of photovoltaic solar panels. These panels transform light from the sun into direct current (DC) electricity, which passes through an inverter to become alternating current (AC) electricity. This electricity can either be used within your home, or exported (sold back) to the utility company. A solar system can be installed on your roof by an accredited installer, and you can receive attractive government incentives for going solar. Lifetime of solar panels is generally accepted to be over 35 years. Although panels will degrade slightly over time, they maintain their ability to generate electricity for many years. Many manufacturers guarantee 80% of the initial output after 25 years. Because of high government incentives it is currently possible to have a pay-back time of around 8-10 years, which leaves 15 years of additional government incentives and free energy! Thin film panels have a shorter lifetime, although this has rapidly improved in recent years. Aesthetics of solar panels can vary and a choice depends on personal preferences. 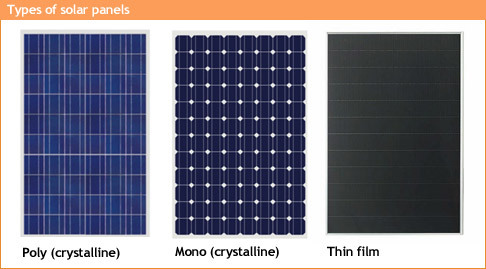 Mono-crystalline panels are cut from a circular tube of material, resulting in rounded corners of each cell. Poly-chrystalline silicon cells are covering the entire surface of the panel, but you can see the shiny sub-facets of the material. Thin-film is available in a more coherent looking panel. Panels are mostly fitted on top of roof tiles, but it’s also possible to use building integrated (BIPV)solar roof ‘tiles’. Personal preference is an important factor, so be sure to ask about the aesthetics of the proposed panel. Inverter: the inverter is used to transform direct current (DC) electricity generated by the solar panel into alternating current (AC) electricity that can be used in the house. The most important characteristics of the inverter are the efficiency (% transformed from DC into AC – usually around 90-95%) and the lifetime. Check your inverter warranty for these details. Installation: while the solar panels make up around 50% of total system costs, the inverter accounts for roughly 10%. This leaves 40% of costs that go into the installation itself. This includes both labor costs (it takes one or two days to install) and materials such as a mounting system and cabling. Finding the right installer is critical in order to go solar in an easy and reliable way. Quality materials and experience of the installer are two important factors to consider, but in the last chapter we mention a more complete list to help you make the choice. Panels, the inverter and the installation combine into a photovoltaic system. The size of a system is denominated in kWp (kilo-watt-peak), which is a measure of performance under standard testing conditions. Actual system outputs depend on your location and roof characteristics (discussed in detail in next chapter) and the solar system derate factor. The derate factor accounts for e.g. panel loss, inverter loss and cable loss. More information about this can be found on the PVwatts website. World solar photovoltaic (PV) installations were 2.8 gigawatts peak (GWp) in 2007, 5.9 gigawatts in 2008, 7.5 gigawatts in 2009, 15 gigawatts in 2010 and 26 gigawatts in 2011. The three leading countries (Germany, Italy and the US) represent most of the total worldwide installed solar PV capacity. There are hundreds of solar panel and inverter companies and thousands of solar panel installers. Due to the rapid expansion of the market, panel prices have been falling in the last years, with a decline of about 50% in 2011 alone. The UK solar market is currently growing rapidly, especially in England. The Feed-in-tariff seems like a great success with over 95% of the UK solar installers entering the market through MCS accreditation only since the FiT introduction in April 2010. With over 4000 solar installers to choose from, the consumer can use some help. CompareMySolar provides this help by making the orientation for solar energy easy and accessible. Choosing to go solar can provide green electricity for your home, gives you a generous financial return, and reduces the carbon-footprint of your house and its appliances. Let CompareMySolar help you to go solar!